Thanks for this. The screenshots are very tough to read though. When I click the text is way too small! Sending out my first shipment to FBA in a few days. (I have been doing self shipping.) Really appreciate this series. I used to print on paper and use the cut and tape approach. Then I created a UPS business account and they will ship you 50 blank 2-up labels at a time. Now it works perfectly to put those in the printer, peel off the stickers, and slap them on the box. When I’m running low, I just order some more and they show up in a few days. They stickers do say for UPS shipping only on them, which is fine because that’s who Amazon’s partner is. Thanks Al! That’s a great tip, I haven’t yet set up a UPS business account, but you can be sure I’ll be doing it tonight! Thanks for sharing. Trevor, when I ship a big box with just 1 item, on the printout, I thought Amazon says to affix that to the outside of the box too. Or maybe I’m mistaken; if not, maybe make that quick edit to your post. Love the series btw. Very helpful to beginners. Good tip by Al above too. 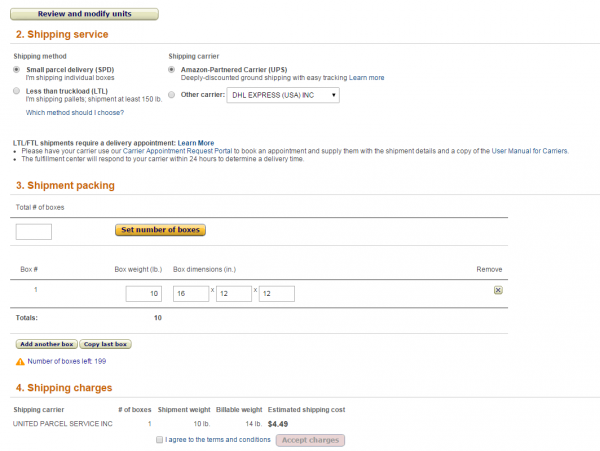 @Miles per Day – Clarification question — Amazon provides shipping labels to affix to the outside of the box. There are sometimes labels required on the actual product (I’ve even had to label Keurigs for example). Are you talking about the “product label” (before you approve the shipment), or the “shipping label” where you put in the measurements of the box and weight? However, on the big 1 item shipments I’ve done so far, that right side of the shipping label says something to the effect of “Do not cover.” I assumed I needed to affix that label to the box as well as the UPS label. Are you saying I don’t need to slap that label on the outside box? Yes, you need to affix both labels to the outside of the box. One is for UPS and the other is for the Amazon FBA warehouse (it tells them whether they need to do additional processing such as labels for one thing). Back in the old days, you put that slip inside the box but it’s easier now that you just stick everything on the outside. I do not end up with anything physical I keep for my records so you might be right in saying that part needs to be edited. @Al and Miles Per Day – I stand corrected… I hadn’t been affixing the second label — as Al says, back in the old days, there was a sheet you’d put in the box, and as I recall, the second half said to keep for your records.. I’ll make the appropriate fix, and, yeah, start affixing that second label! There isn’t a way to consolidate different SKUs in the same box is there? For say when you want to ship 2 different laptops/tablets in the same box. @Andy, There is, but it takes a bit of work. I’m working on a post about that this weekend in fact. 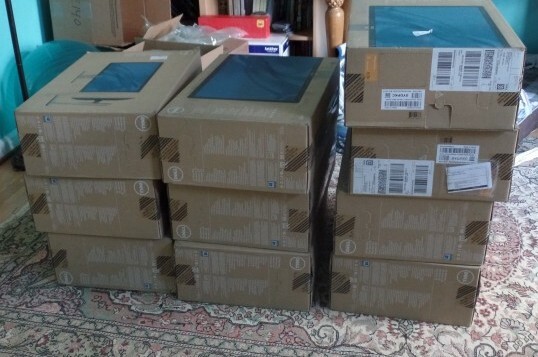 I am new to FBA and just purchased some iPad minis for resale, planning to ship tomorrow. I hope you can help with my question – i ordered them for instore pickup and Best Buy placed these huge stickers on the box. They look impossible to remove without tearing or distorting the shrink wrap. Do you think it’s okay to just black out the information on the sticker and send it in? Or attempt a removal? @Eddy Cue – My recommendation would be to try to get something like “Goo be gone,” to remove the label. I certainly would avoid sending in the iPad Mini’s with the stickers on, unless you can put your own stickers over top and completely cover them. Unfortunately sometimes stores will label products bought on line for pick up in store. It definitely makes it challenging to resell, but should not be impossible. You can also use a hair dryer on gentle heat to soften the adhesive before gently pulling off the label. Hi Trevor – I’m about to send in my first monitor to FBA. How do I label it? I was thinking that the two shipping labels just get slapped onto the side of the box. But as I thought about it more I realized that I’ve never received anything from Amazon that had those two shipping labels on them – so does Amazon peel them off before shipping to the buyer? Or do I have to put the monitor (which is in the original Dell box) into another box and affix the shipping labels to that box? Thanks in advance – trying to make sure my first monitor doesn’t get lost or returned to me.